Councillor Susan Aitken, Leader of Glasgow City Council, was joined by project partners to mark the construction of Europe's first ever 'smart canal' scheme. This project will combine the 250-year-old Forth & Clyde Canal with 21st century technology to mitigate flood risk as well as enable massive regeneration. The pioneering new digital surface water drainage system will unlock 110 hectares across the north of the city for investment, regeneration and development, paving the way for more than 3000 new homes. The £17million project, being delivered via a partnership of Glasgow City Council, Scottish Canals and Scottish Water under the umbrella of the Metropolitan Glasgow Strategic Drainage Partnership (a Glasgow City Region City Deal project - more detail at http://www.mgsdp.org), will use sensor and predictive weather technology to provide early warning of wet weather before moving excess rainfall from residential and business areas into stretches of the canal where water levels have been lowered by as much as 10cm. This will create 55,000 cubic metres of extra capacity for floodwater - equivalent to 22 Olympic swimming pools. Officially named the North Glasgow Integrated Water Management System (NGIWMS), the project to create a so-called 'sponge city' - a term used to describe how cities respond to surface water flooding - will see North Glasgow passively absorb, clean and use rainfall intelligently. Advanced warning of heavy rainfall will automatically trigger a lowering of the canal water level to create capacity for surface water run-off. Before periods of heavy rain, canal water will be moved safely through a network of newly created urban spaces - from sustainable urban drainage ponds to granite channels - that absorb and manage water in a controlled way, creating space for surface water run-off. 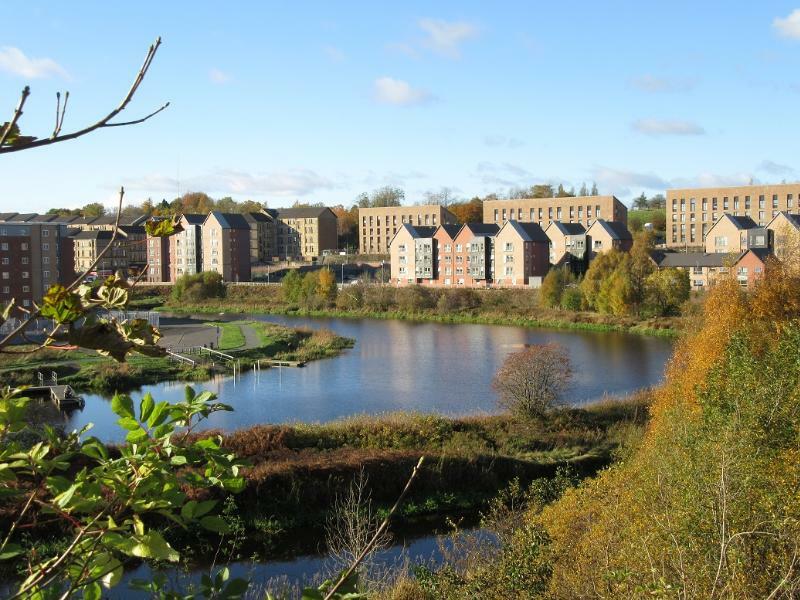 The scheme will unlock 110 hectares across the north of the city for investment, regeneration and development, and will see the Forth & Clyde Canal connected to five new sites over the next 10-15 years, including Sighthill, Hamiltonhill, Ruchill Hospital, Cowlairs and Dundashill. The capital funding for the scheme comes from the Glasgow City Region City Deal and the European Regional Development Fund via the Green Infrastructure Fund and Scotland's 8th City - the Smart City. The project was launched by Glasgow City Council Leader Susan Aitken, Scottish Canals' CEO Catherine Topley and Simon Parsons from Scottish Water with the signing of a 60-year service agreement. Councillor Susan Aitken, Leader of Glasgow City Council and Chair of the Glasgow City Region City Deal Cabinet, said: "This is a fantastic day for Glasgow's Canal, as we mark the introduction of cutting-edge technology that will both allow surface water in this part of the city to be managed, and allow the building of new homes and businesses on land that historically has been unfit for development. It is very exciting to see such smart technology in operation in Glasgow - one of very few examples in the world - and we can look forward to it playing a key role in the continued regeneration of Glasgow's Canal and the north of the city." Catherine Topley, CEO at Scottish Canals, said: "By unlocking the inherent value of Glasgow's Canal and diversifying how we use this publicly-owned heritage asset, we are ensuring it continues to deliver for local people 250 years after it was first built. Creating a dynamic urban canal which uses smart technology to move water safely about the city will not only reduce the flood risk impact of climate change, but act as a catalyst for new investment, jobs, homes and businesses in North Glasgow as well as help to create one of the city's top tourist destinations." Effective collaboration between Glasgow City Council, Scottish Canals and Scottish Water, has transformed this visionary concept into reality after a decade of hard work and commitment. As part of the project, Scottish Water will vest and maintain all underground pipes that are connected to a Scottish Water system and will maintain some of the Sustainable Urban Drainage Systems (SUDs). Simon Parsons, Scottish Water's Strategic Customer Services Planning Director, said: "Scottish Water is delighted to be involved in this unique project that enables development in Glasgow and manages flood risk using the canal. This will help manage the impact of climate change on the sewer network. This is the sort of development that we are wanting to see more of and are working with local authorities across Scotland under our Storm Water Strategy to deliver." A short video explaining the operation of Glasgow's Smart Canal can be found at: https://www.youtube.com/watch?v=MFykgGeee1o.